Generally, all ferrous and nonferrous metals can be used in the investment casting process to produce components. In terms of ferrous metals, the most commonly poured materials include ductile iron along with tool, carbon and alloy steels, as well as the 300, 400, 15-5PH and 17-4PH stainless steel alloys. In terms of non-ferrous metals, most copper-based metals as well as magnesium and aluminium can be cast. Aluminium investment casting is the most popular among non-ferrous metals. Furthermore, the use of exotic alloys, such as titanium and vanadium, are also possible, enabling the achievement of high requirements and demands set out by specific industries. An excellent example of this would be the titanium alloys used to produce the turbine blades and vanes used in aerospace engines. Ceramic molds used in investment casting are unlike those used in other casting processes and can reach temperatures of over 1 500°F (or 816°C). This not only increases their strength, but also allows for high-temperature pours. This fact makes the process ideal for ductile iron and steel investment casting. Compared to other casting methods, investment casting has an average tooling cost, the most metal options and offers the most design freedom. Though the cost per unit is high compared to other casting methods, it offers an average surface finish, average tolerance control, an average size range, an average wall thickness minimum, and no drafts are required. Alloys used in aluminum investment casting all have a density of 2.7 g/cm³ with the exceptions of A 2014, 712 and 713 (which all have a density of 2.8 g/cm³), and 535 (which has a density of 2.6 g/cm³). 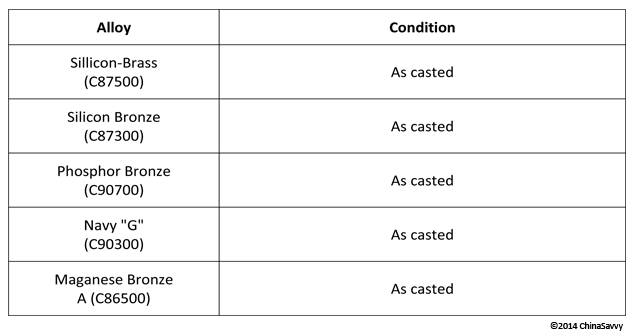 In terms of hardenability, only the alloys 514 and 535 are not hardenable. With the main alloying element being copper, it is a high strength alloy that has an excellent machinability, and a fair weldability and corrosion resistance. Main alloying elements are silicon, copper and/or magnesium, and it is a high strength alloy with excellent ,machiniability, a fair resistance to corrosion and is fairly weldable. Main alloying elements are silicon, copper and/or magnesium. This alloy is has a good strength, is leak-proof, pressure tight and offers good resistance to corrosion. It also offers very good weldability and good machinability. Main alloying elements are silicon and copper, and it is a premium quality 355 aluminum alloy. Offering very good weldability and castability, with good machinability and a good resistance to corrosion. Main alloying elements are silicon, copper and/or magnesium. It is the most popular aluminum alloy and has a good strength, a good resistance to corrosion, is pressure tight and also offer stability. A premium quality 356 alloy, it has good weld-ability and poor brazability. It also offers a very good resistance to corrosion as well as weldability. Main alloying element: silicon, copper and/or magnesium. Offering a higher strength than the A 356 alloy, it is a premium quality alloy. The main alloying element: silicon, copper and/or magnesium. The alloy offers excellent weldability with a very good resistance to corrosion. Excellent for anodizing, the main alloying element is magnesium. This alloy offers excellent resistance to corrosion, very good weldability and excellent machinability. This alloy offers the best as-cast properties and are ideal for use in corrosive applications and environments such as marine applications because it has such an excellent resistance to corrosion. The main alloying element here is magnesium. A good brazing and self aging alloy, the main alloying element here is Tin. This alloy offers excellent machinability, good resistance to corrosion and a fair castability. Offering excellent machinability, the main alloying element is Tin. For more information on Aluminum Grade Series, please visit our Aluminum Grades for Sheet Fabrication page where you will find the full details pertaining to the grades of aluminum. Carbon steel alloys are known for their poor resistance to corrosion, with many alloys in this group having a fair to good machinability. All these alloys are hardenable and have a density of 7.8 g/cm³, with the exception of 1010 and 1020, which each has a density of 7.9 g/cm³. Used in electrical components, this alloy has a good weldability and machinability. A high impact, carburizing alloy, it has a good machinability as well as weldability. 1040 offers medium strength with a good weldability and a poor resistance to corrosion. 1050 offers a medium strength and has a goog machiniability as well as weldability. This alloy is a high strength alloy, it has a poor resistance to corrosion and fair weldability. Used for structural parts requiring welding and has a high strength and a high resistance to fatigue. It offers good weldability coupled with very good machinability and castability. This alloy has a high hardenability, good resistance to fatigue, abrasion and good impact resistance. It also offersvery good weldability. Offers better hardenability than 4140, a very good machinability and weldability, but a poor resistance to corrosion. This carbon steel alloy has a high hardness and strength, a high shock resistance and are also adaptable for high-stressed machine parts which undergo heat treatment after machining. In addition, it also has a very good castability coupled with a good weldability. A carburizing alloy steel used for stressed parts, it has a good castability, machinability and weldability. In often cases used for shafts and small machine parts, this alloy has a good castability, machinability and weldability. Hard and offers a high resistance to abrasion, this alloy has a poor resistance to corrosion and a good weldability. Oxidation resistant to 870°C (or 1600°F), this alloy has a very good resistance to corrosion coupled with a good castability. This alloy boasts with fantastic wear characteristics and a high resistance to hot corrosion. Fairly weldable, it has a poor machinability but good castability. 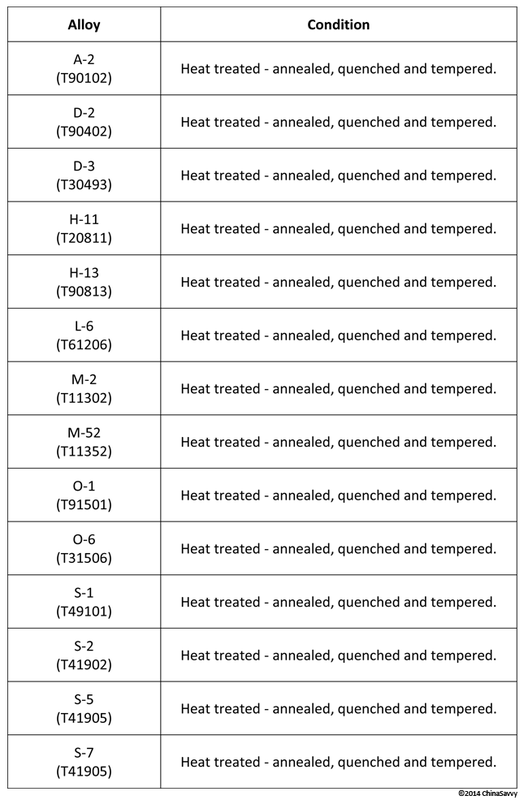 This alloy yields a good strength in high temperature conditions under oxidation conditions of up to 760°C (or 1800°F). It also offers resistance to hydrochloric acid, offers good weldability and is fairly machinable. This alloy is resistant to oxidation and wet chlorine gas, is resistant to 950°C (1800°F) and offers good weldability. This alloy has an oxidation resistance of up to 1 200°C (or 2 200°F). It has a good weldability and is fairly machinable. This alloy offers a good resistance to corrosion at room and elevated temperatures. In a sulfurous atmosphere, this alloy is highly resistant to corrosion at temperatures of up to 825°C (1500°F) and offers good machinability. With an excellent resistance to wear, this alloy is also age hardenable, offers very good weldability and good machinability. With a large grain size, this alloy has poor resistance to wear, a low hysteresis loss and poor weldability. It does however offer good castability and machinability. With a large grain size, this alloy also has poor resistance to wear, a low hysteresis loss and a poor weldability. This alloy has magnetic permeability, a high strength, good desity excellent weldability and good machinability. Copper based alloys are not hardenable and have a density of 8.3 g/cm³, with exceptions being Phosphor Bronze (with a density of 8.8 g/m³) and Navy "G" (with a density of 8.7 g/cm³). This alloy has a high strength at high temperatures, pressure tightness and a very good corrosion resistance. This alloy is also known for its toughness and very good castability. This alloy is used instead of pure copper in cases where strength is a requirement because it has a high strength at elevated temperatures. It offers good weldability, machinability and a good resistance to corrosion. This alloy keeps its tensile strength, impact strength and ductility at lower temperatures. This alloy offers very good machinability and very good resistance to corrosion. This alloy is used in high pressure applications and conditions, offering a very good resistance to corrosion and good weldability. Components include bushings and bearings. This alloy works in both fresh and salt water environments, and offers an excellent resistance to corrosion and very good machinability. All ductile irons used in investment casting (below) have fair weldability, offer excellent castability and are all hardenable. These ductile irons also have a poor resistance to corrosion and a very good machinability. 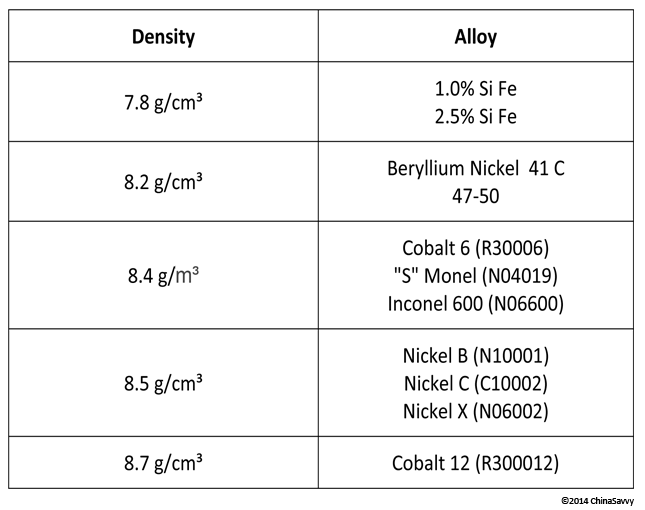 All alloys mentioned below has a 7.1 g/m³ density. * - ADI has a lower density as steel, a high strength, great elongation characteristics and excellent damping characteristics, making it a terrific material for the use in various high-wear components such as camshafts, suspension components and plow points. 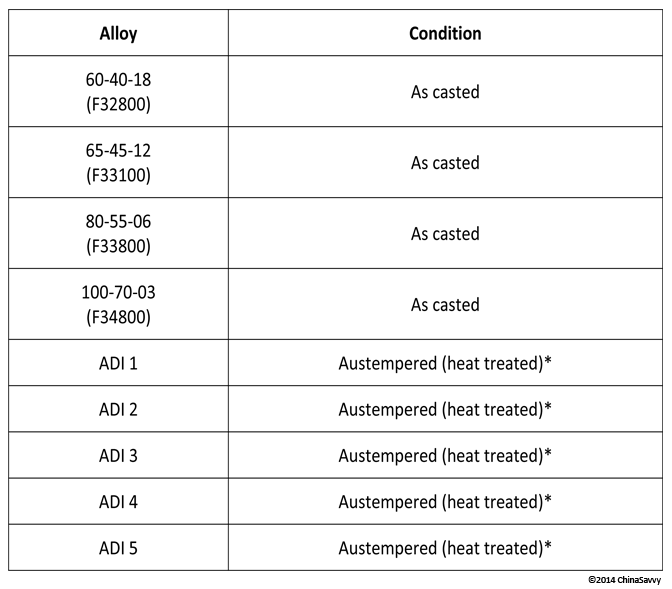 Precipitation hardening, a heat treatment technique also known as age hardening, increases the yield strength of the material and, in superalloys, the causes yield strength anomaly which causes the material to have a high strength at high temperatures. These hardened steel alloys all have a density of 7.8 g/cm³, a good machinability and a very good resistance to corrosion. 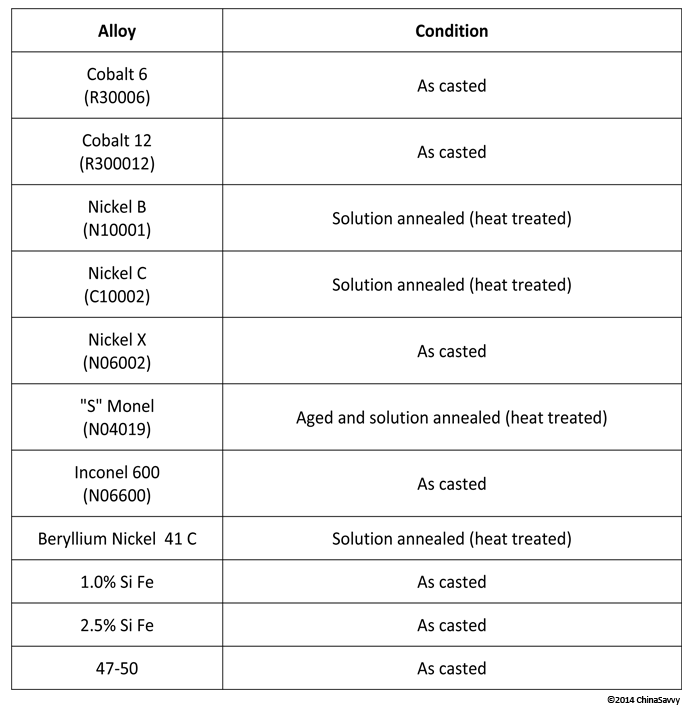 This alloy has a greater malleability that 17-4PH. A very popular alloy, it offers hardness, a good resistance to corrosion and can be easily machined. This alloy offers the best combination of resistance to corrosion and strength. Solution annealed alloys in this category has a density of 8.0 g/cm³ and are not hardenable, while the heat treated - annealed, quenched and tempered - alloys are hardenable. With densities ranging from 7.65 g/cm³ (440C) to 7.75 g/cm³ (436 Greek Ascoloy and 410CA-15). This alloy offers the best combination of both resistance to corrosion and castability. It also has a fair weldability. A poor weldability and fair machinability. 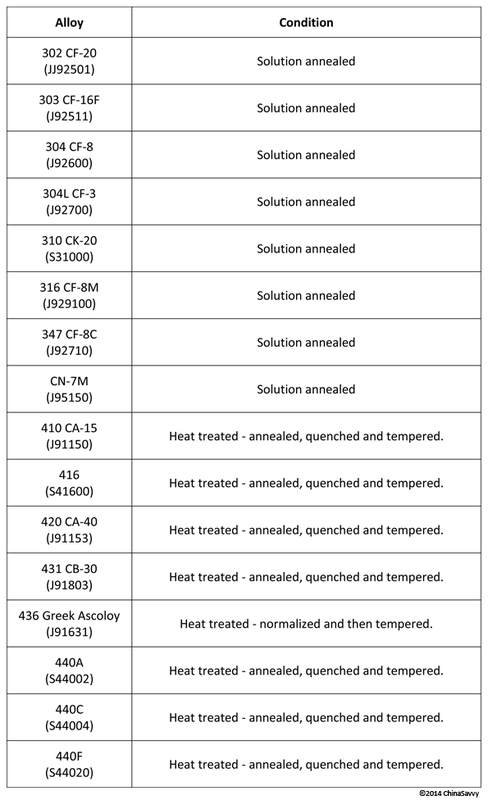 304 offers a better resistance to corrosion than 302 and 303. It also has a very good weldability and is fairly machinable. 304L offers excellent weldability and corrosion resistance, and is fairly machinable. Great for use in thinner sections and sections that require finer detail, it also has a smooth surface finish. 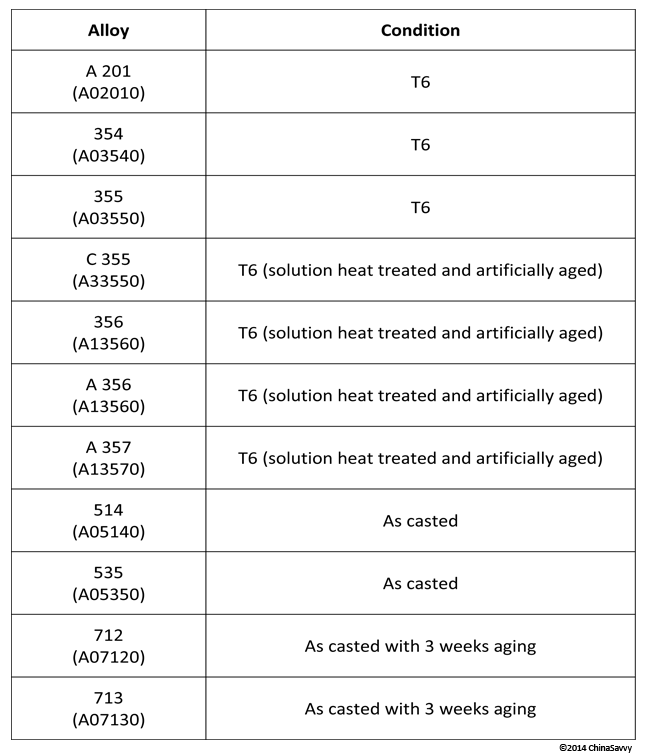 Offering moderate strength at high temperatures , this alloy also has an oxidation resistance to 1 000°C (2 000°F), and a good weldability, castability and machinability. This alloy has an oxidation resistance of up to 870°C (1 600°F), offers excellent corrosion resistance and castability, while offering good weldability and fair machinability. Uses: food processing, ship hardware and paper processing. It offers excellent weldability and machinability, while having a very good castability and good machinability. Resistant to sulfuric acid, this alloy has excellent weldability and corrosion resistance, coupled with a good machinability and castability. This alloy offers the best combination of resistance to corrosion and hardness, coupled with a very good castability and machinability. A less though alloy than 410, it does offer a better machinability. It also has a fair castability and a poor weldability. 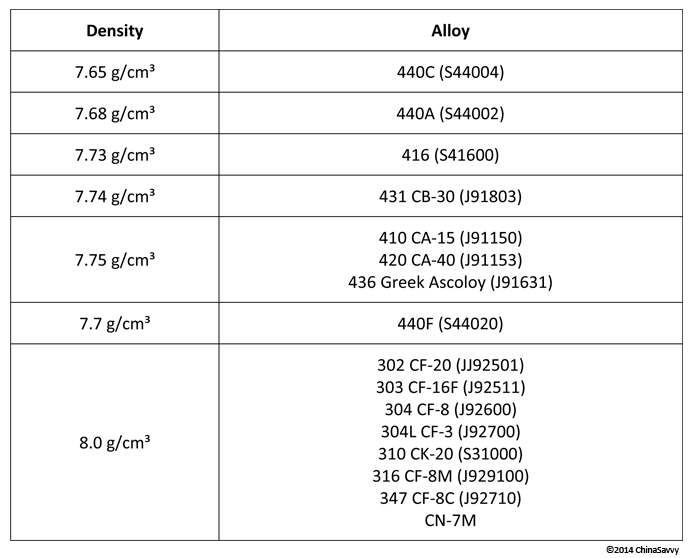 This alloy offers a better hardness than 410, but is not as tough as 410. It has a very good castability and resistance to corrosion, while having a good weldability and machinability. This alloy offers the highest resistance to corrosion out of all the 400 Series Steels. It also has a good castability, machinability and weldability. 431 is mostly used in products were high strength and maximum resistance to corrosion is required. 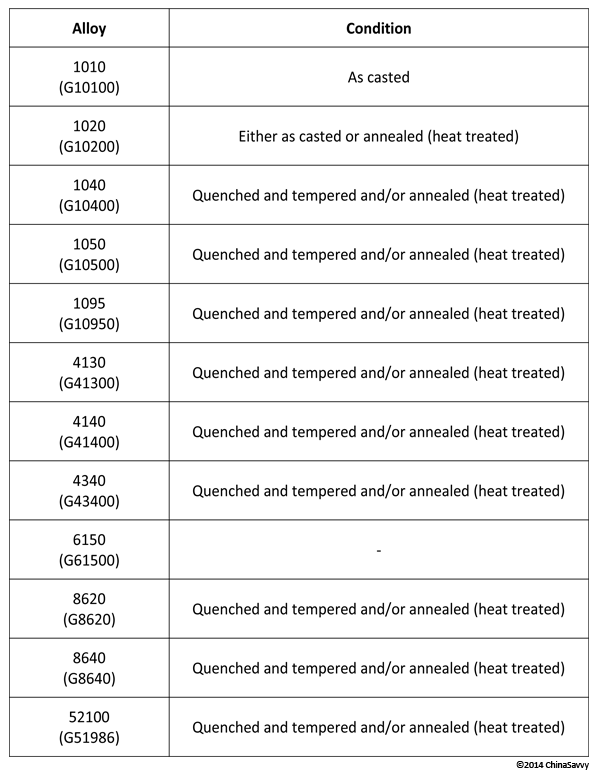 Often a substitute for higher costing high alloy steels, it has an oxidation resistance of up to 825°C (1 500°F), a heat resistance of up to 540°C (1 000°F), very good machinability and castability, paired with a good machinability. 440A offers a high hardness and malleability, has a good castability, fair machinability and corrosion resistance, and poor weldability. It is often used for molds and cutlery. 440C is the best cutlery grade alloy and offers a good machinability. Its resistance to corrosion is fair, while its weldability is poor. This alloy is the more machinable grade of 440C and has a poor weldability, and a fair castability and resistance to corrosion. All tool steel alloys are hardenable and has a density of 7.8 g/cm³, with the exception being S-1(T49101) with a density of 7.9 g/cm³. A-23 has a fair toughness, a good retention of harness at high temperatures and a good resistance to wear. It has a poor corrosion resistance coupled with a good weldability, castability and machinability. Uses: forming gauges, bushings and punches. This alloy has a very good resistance to wear, a poor resistance to corrosion, a good retention of hardness at high temperatures and a poor toughness. D-2 also has a fair castability and machinability. Uses: cutters, forming dies, shear blades and broaches. With a poor toughness and a good retention of hardness at high temperatures, this alloy offers a fair resistance to wear. Furthermore it has a fair castability, fair machinability and a poor weldability. Uses: cutters, forming dies and shear blades. H-11 has a poor toughness, a fair resistance to wear and a good hardness retention at high temperatures. This alloy also has a poor weldability, coupled with a fair castability and machinability. Uses: structural components that require high strength, piercing tools and extrusion tooling. Like H-11 this alloy has a poor toughness, a fair resistance to wear and a good hardness retention at high temperatures. It has fair machinability and castability, and a poor weldability. Uses: structural components that require high strength, die inserts, piercing tools and extrusion tooling. Having a fair toughness, L-6 offers poor resistance to wear and a poor retention of hardness at high temperatures. This alloy also has good machinability, fair weldability and castability, and a poor resistance to corrosion. Uses: press brake dies, ratchets, shear blades, gears and clutch parts. Offering a very good retention of hardness at high temperatures, it has a poor toughness and good resistance to wear. M-2 also has a fair weldability, castability and machinability, coupled with a poor resistance to corrosion. Uses: cutters, drills, end mills, woodworking tools and taps. Like M-2, this alloy has a poor toughness, a good retention of hardness at high temperatures and good resistance to wear. Furthermore, this alloy has good castability, weldability and machinability, coupled with a poor resistance to corrosion. Uses: cutters, drills, end mills, woodworking tools and taps. O-1 has a poor toughness, but a very good resistance to wear and a very good retention of hardness at high temperatures. Uses: shear blades, punches, dies, reamers, bushings and gauges. This alloy has a good castability and a good machinability, but a poor resistance to corrosion coupled with a fair weldability. Uses: wear plates. Tool shanks, arbors, guides and cold-forming dies. S-1 has a poor resistance to wear and a fair retention of hardness at high temperatures. Offering a good toughness, this alloy has a good machinability and very good castability. Uses: grippers, chisels, concrete drills and chisels. Offering a good toughness, S-2 has a poor resistance to wear and a poor retention of hardness at high temperatures. This alloy also has a very good castability, good machinability and fair weldability. Uses: screw driver bits, nail sets, stamps and forming tools. S-5 offers a good toughness, but a poor wear resistance and only a fair retention of hardness at high temperatures. It also has a very good castability and good machinability. Uses: tool forming, shears, drift pins and bending dies. Having a fair retention of hardness at high temperatures, this alloy has a poor resistance to corrosion, but a good toughness. It also offers fair weldability, good machinability and very good castability. Uses: engraving dies, chuck jaws, clutches, shears and gripper dies. Investment casting aluminum is just one of the many fields we are specialized in. ChinaSavvy is able to produce investment casting using appropriate alloys in focused casting processes, including steel investment casting and aluminum investment casting processes. How precise is Investment Casting?